Master's Saints' winger Alex Dimitriu has been one of the bright sparks in League1 Ontario's first season, racking up seven goals to date and proving a handful for opposing markers with his speed and craft on the ball. "I just try and stay moving," says Dimitriu. "My teammates do a lot of the work, and I just stay in the right position doing my job. I like to play through the middle, and get in front of the net, and our system is based on that – getting wingers near the net. Our coach gives us a lot of freedom." A youth product of Master's Futbol Academy, Dimitriu is quick to praise the preparation he has received over the past five years of his player development. "It's a really great program,” explains Dimitriu. "The coaches – especially Junior Groves and Andre – really train you hard, always looking to prepare us for opportunities overseas, or at the national levels. We are expected to carry ourselves like professionals. Junior has a lot of experience in the game and our training sessions reflect that – the ball is always on the ground, and we're trained to constantly keep it. It is really Junior that has helped me the most in my development." It was through Dimitriu's connection with Master's and Junior Groves that he found himself in England at only fourteen years of age, trialing with the youth academy at Notts County F.C., an experience he credits for his ability to adapt to League1 play. "Junior helped me get the opportunity, and so I was there for three weeks and did very well," recalls Dimitriu. "They asked me to come back and said I would be signed if my family were to move over permanently. I was very young and needed to look at my options past football as well, so we decided to come back to Canada." "I was playing with what they called their football scholarship program, an age group a few years older than me as well,” he says. “I learned a lot about the game, and got a sense of what it is really like. Everything was just faster, not just the running but in the decision-making and knowledge of the game – they just process it quicker than us. This is what Master's philosophy is focused on as well." As a young player still learning and developing, Dimitiru points to this experience abroad and Master's philosophy of coaching as the key reasons for his ability to adapt to a more physical, high-tempo game at League1 level. "Within our own academy we have some very experienced players, and it's really just about using your head as a younger player. You have to work with what you've got, and [younger players] may not have the speed and strength but we have the technical ability, which is what the academies give you. This is where MFA really stands out in my mind. We have white board and video sessions all the time, and really go in depth. The players really learn the game." The learning doesn't stop there either. As products of an academy environment, players in the first team at Master's are expected to coach and tutor younger players in the academy. 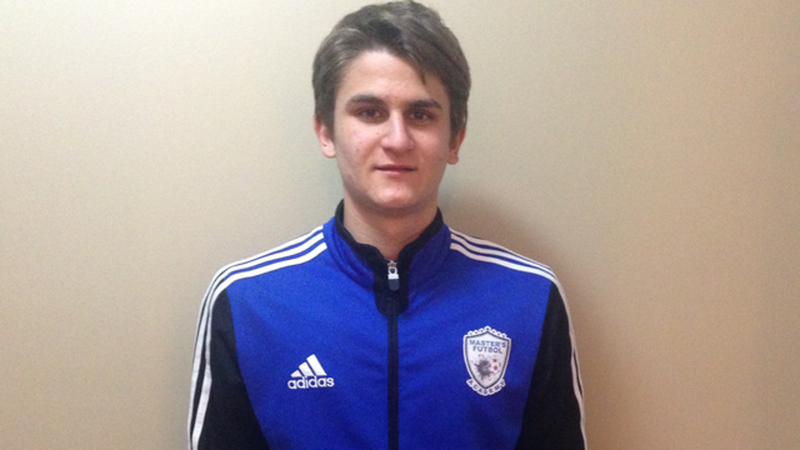 "We are expected to be examples for the younger guys in the academy," says Dimitriu. "And at the same time they really push us when they are given the chance to train and play with us, even though they are younger. It's all within the system at Master's, we all push each other. Junior is always promoting the youth, so everyone pushes each other. It's important for the youth to have a vision of what can come next." In terms of what comes next for Dimitriu, he is firmly focused on the top. "I have my sights set on reaching MLS, Europe, or especially the Canadian national team, turning my dreams into something real," he concludes. "I'm just waiting for the right opportunity, and hope I can take my chance when it comes." "I think League1 is a great place to showcase yourself, and expect that the national team is looking there for players that may have been overlooked. This is place where you can really show yourself, and there are a lot of players in the league who maybe never got a chance that are really excelling, and deserve a look. For me, everyday I look up to the players in my academy and in the league, and I'm just trying to stay with the pack."